Rent a house right by the sea and spend your afternoons on the sandy beaches in Liguria! There is a multitude of sandy beaches along the ligurian coast, both public and managed. There are well-maintained beach sections there, partly with a very good lunch menu and a bar which offers you snack meals and an unforgettably good cup of espresso. In addition there are beaches for all tastes, physical fitness beaches, luxury beaches, beaches with oriental couches and pet friendly beaches as well as pedal boat and and surfing board rental agencies. Find a holiday house by the sea! There are several dog beaches in Liguria, at which your four-footed family member will be courted like a young prince. 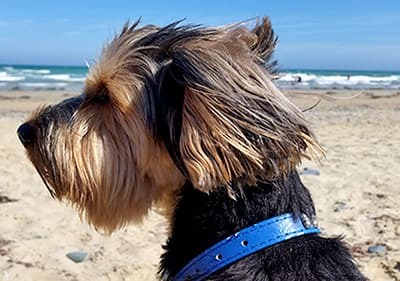 These lovingly well-kept dog beaches offer dog showers, sufficient shady places, drinking troughs and even dog playgrounds or dog couches in some of them. 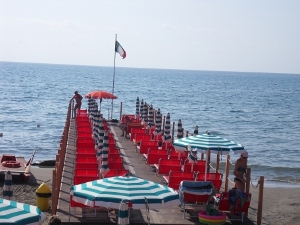 Public beaches in Italy can be recognized by the label "Spiaggia libera" or by the fact that there are no couches and sun-shades bearing the "Bagni” label which means that fees are imposed. You will find the public beaches always between the paid beaches since every municipality must grant the general public access to water. Public beaches can be used from morning until evening - 7:00 p.m. The blue flags (Bandiere Blu ), which are issued every year by the Foundation for Environmental Education in accordance with set quality criteria, embody the promise of best quality beaches. 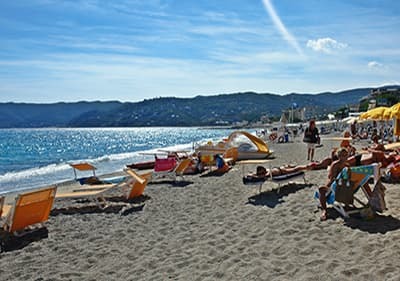 With 23 blue flags in 2015 alone, Liguria boasts of the most of excellent beaches with regard to cleanness and high water quality, compared to other Italian regions. A vacation in Liguria is always something special - enjoy the mountains and the sea, tranquility and relaxation. The more you look around at centrally located beaches, the fuller they are. Our advice - look for the beaches situated at the far ends of the bay (which are in most cases a bit hidden), there you can spend relaxing time at the beach more privately. 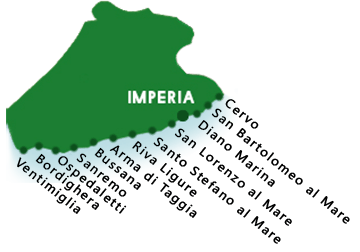 The province of Imperia extends from Cervo to Ventimiglia in the west of Liguria. This part of Italy is also described as the BlumenRiviera. You will find many child-friendly sandy beaches there, as well as quiet gravel and stone bays. Leisure amenities on the Italian coast are varied; from cycling directly by the sea on Pista Ciclabile to beach volleyball, surfing and whale-watching - there is always something for every taste. Hop onto the bicycle and discover beautiful remote beaches directly from the Pista Ciclabile! In that way you can tour the various villages and their beaches without the stress of looking for parking space. Cities which have a bicycle symbol offer direct access to the cycling path and walkway along the sea. This part of Liguria is also referred to as the Palmenriviera. 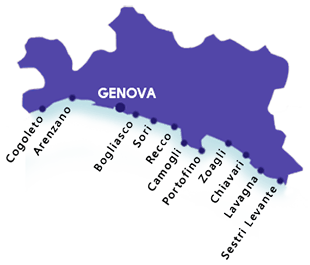 A particularly large number of beaches in this area are awarded with the Bandiera Blu award. Long sandy beaches, hidden bays and lovely promenades lined with palm trees will make your vacation something to remember. The Palmenriviera is a tourist destination all year round due to its mild climate. There are many top destinations for excursion and culinary specialties are waiting for you! The province of Genova in eastern Liguria has got lovely beaches. 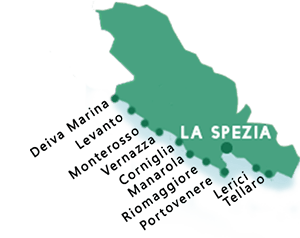 The province of La Spezia lies in eastern Liguria, at the border with Tuscany. 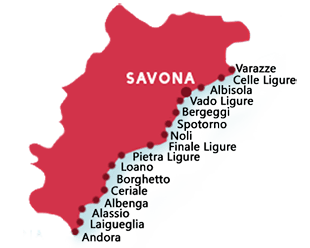 The province is famous especially for the Cinque Terre national park, an approx. 12 km long coastal stretch with the 5 villages of Monterosso al Mare, Vernazza, Corniglia, Manarola and Riomaggiore.The picturesque multi-colored house fronts and the steeply sloping coastlines will fill thrill you! The villages and beaches at the Golfo dei Poeti (Gulf of Poets) are also worth seeing. The wide and relatively deep bay extends from Portovenere through the provincial capital La Spezia to Lerici. Open from 9.00 until 7.00 o'clock. Animation and swimming-school for kids. sand, handicapped accessible, restaurant, water gymnastics, snack bar, WC/restrooms, showers, locker rooms, parking options, sunbeds/umbrellas, image, Open from 9.00 until 7.00 o'clock. Animation and swimming-school for kids. Open: every day from 8.00 a.m. - 7.00 p.m. Price for 2 sunbeds and 1 parasol between 15 and 20 (seasonal). Offer: For 6/day you can borrow a sunbed. sand, handicapped accessible, snack bar, WC/restrooms, showers, locker rooms, sunbeds/umbrellas, image, Open: every day from 8.00 a.m. - 7.00 p.m. Price for 2 sunbeds and 1 parasol between 15 and 20 (seasonal). Offer: For 6/day you can borrow a sunbed. Open every day from 8.30 a.m. - 19.00 p.m. Price for 2 sunbeds and 1 parasol between 12 und 20 (seasonal). Offer: swimming courses. sand, playground, restaurant, beach volleyball, water gymnastics, WC/restrooms, showers, locker rooms, sunbeds/umbrellas, image, Open every day from 8.30 a.m. - 19.00 p.m. Price for 2 sunbeds and 1 parasol between 12 und 20 (seasonal). Offer: swimming courses. Open every day from 8.00 a.m. - 7.00 p.m. Price for 2 sunbeds and 1 parasol between 13 and 21; 1 sunbed on the solarium-terrace: 8. sand, handicapped accessible, playground, WC/restrooms, showers, locker rooms, sunbeds/umbrellas, image, Open every day from 8.00 a.m. - 7.00 p.m. Price for 2 sunbeds and 1 parasol between 13 and 21; 1 sunbed on the solarium-terrace: 8. Internet: approx. 5 per day. Snack bar: pizza, salad, fruits, bread, melon and ham, ice cream. 2 sunbeds and 1 parasol: June until September: 25 per day; August: 30 per day. Sports: Aquagym, Spinning and Pilates. Towels included. Optionally, you can rent a private changing room. (4 persons, 12) The beach is open all year round. Further languages available: Portuguese and Spanish. sand, water gymnastics, snack bar, WC/restrooms, showers, locker rooms, sunbeds/umbrellas, Internet: approx. 5 per day. Snack bar: pizza, salad, fruits, bread, melon and ham, ice cream. 2 sunbeds and 1 parasol: June until September: 25 per day; August: 30 per day. Sports: Aquagym, Spinning and Pilates. Towels included. Optionally, you can rent a private changing room. (4 persons, 12) The beach is open all year round. Further languages available: Portuguese and Spanish. 15 - 20  for one day ; 145 - 175  for one week (with seasonal variations). sand, pebble, playground, snack bar, WC/restrooms, showers, locker rooms, parking options, sunbeds/umbrellas, image, 15 - 20  for one day ; 145 - 175  for one week (with seasonal variations). Open every day from 8.30 a.m. to 7.00 p.m. Price for 2 sunbeds and 1 parasol: between 19 and 23 (seasonal). Offer: swimming courses. sand, handicapped accessible, playground, child care, water gymnastics, snack bar, WC/restrooms, showers, locker rooms, sunbeds/umbrellas, image, Open every day from 8.30 a.m. to 7.00 p.m. Price for 2 sunbeds and 1 parasol: between 19 and 23 (seasonal). Offer: swimming courses. Subject to row, 10 to 30  for one day and 70 to 130  for one week. sand, playground, snack bar, WC/restrooms, showers, locker rooms, parking options, sunbeds/umbrellas, image, Subject to row, 10 to 30  for one day and 70 to 130  for one week. Open: 8 a.m. - 7 p.m.; price for 2 sunbeds and 1 parasol: till 31.07.: 19.50 /01.08. - 24.08.: 22 /till 30.09.: 14,50 , special offer: course latino, mini-club. 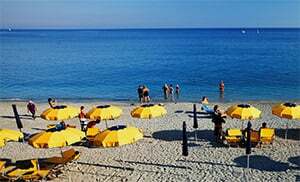 sand, handicapped accessible, restaurant, beach volleyball, paddle boat rental, water gymnastics, snack bar, WC/restrooms, showers, locker rooms, parking options, sunbeds/umbrellas, image, Open: 8 a.m. - 7 p.m.; price for 2 sunbeds and 1 parasol: till 31.07.: 19.50 /01.08. - 24.08.: 22 /till 30.09.: 14,50 , special offer: course latino, mini-club. sand, restaurant, snack bar, WC/restrooms, showers, locker rooms, sunbeds/umbrellas, image, 9 a.m. - 7 p.m.
Price for 2 sunbeds + parasol: 22 - 25 (seasonal). pebble, handicapped accessible, paddle boat rental, WC/restrooms, showers, locker rooms, sunbeds/umbrellas, image, Price for 2 sunbeds + parasol: 22 - 25 (seasonal). Entrance: 3 per person (parking included), dogs free. Optionally, you can rent sunbeds (10), Chairs (7) and parasols (7). (2008 Prices) Dog-showers, snack bar and ample space for your dog. Opening hours: 8.00 - 6.00. Seasonal opening hours: last weekend of May until last weekend of October. rock, pebble, dogs allowed, snack bar, WC/restrooms, showers, locker rooms, parking options, sunbeds/umbrellas, Entrance: 3 per person (parking included), dogs free. 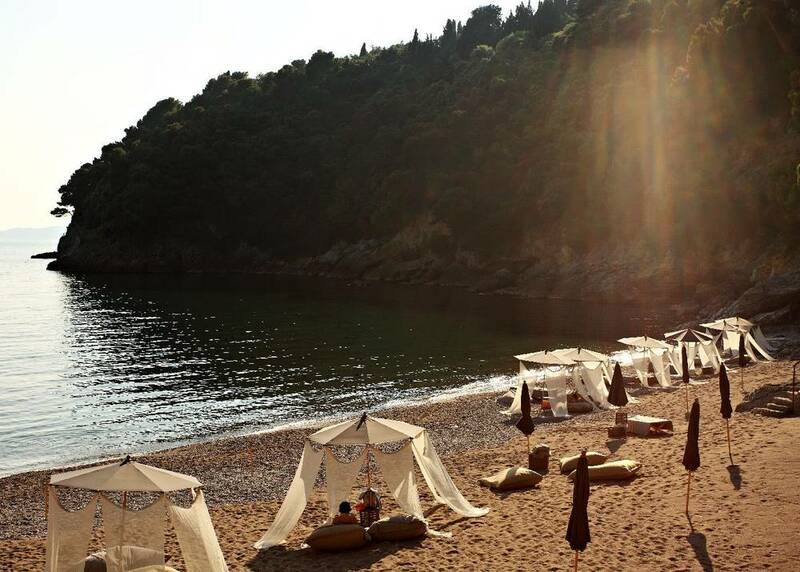 Optionally, you can rent sunbeds (10), Chairs (7) and parasols (7). (2008 Prices) Dog-showers, snack bar and ample space for your dog. Opening hours: 8.00 - 6.00. Seasonal opening hours: last weekend of May until last weekend of October. 2 sunbeds and one parasol cost 20 for one day and 100  for a week. Sunbed at the edge of the sea: 5 . sand, playground, snack bar, WC/restrooms, showers, locker rooms, parking options, sunbeds/umbrellas, 2 sunbeds and one parasol cost 20 for one day and 100  for a week. Sunbed at the edge of the sea: 5 . Open: every day from 8 a.m. to 7 p.m. Price for 2 sunbeds and 1 parasol: 13 - 20(seasonal). sand, handicapped accessible, snack bar, WC/restrooms, showers, locker rooms, parking options, sunbeds/umbrellas, image, Open: every day from 8 a.m. to 7 p.m. Price for 2 sunbeds and 1 parasol: 13 - 20(seasonal). 8 a.m. - 7.30 p.m.
sand, pebble, restaurant, beach volleyball, snack bar, WC/restrooms, locker rooms, sunbeds/umbrellas, image, 8 a.m. - 7.30 p.m.
Open: every day from 8.00 a.m. - 7. p.m. Price for 2 sunbeds and 1 parasol between 15 and 20 (seasonal). sand, handicapped accessible, restaurant, WC/restrooms, showers, locker rooms, sunbeds/umbrellas, Open: every day from 8.00 a.m. - 7. p.m. Price for 2 sunbeds and 1 parasol between 15 and 20 (seasonal). The beach opens at around Easter and closes at the end of September. It's possible to visit the area and to swim each day between 8.00 and 7.00 o'clock. It is also the possible to swim after 7.00 o'clock without a guide. It costs 4  for the use of a changing room. Daily costs are 18  + 4  for the changing room. Without the parasol the costs are 8  + 4  for the changing room. sand, playground, restaurant, snack bar, WC/restrooms, showers, locker rooms, parking options, sunbeds/umbrellas, image, The beach opens at around Easter and closes at the end of September. It's possible to visit the area and to swim each day between 8.00 and 7.00 o'clock. It is also the possible to swim after 7.00 o'clock without a guide. It costs 4  for the use of a changing room. Daily costs are 18  + 4  for the changing room. Without the parasol the costs are 8  + 4  for the changing room. Prices for 2 Sunbeds and 1 parasol: in August approx. 20 (early and low season, approx. 10-15. Wind surfing school; prices: 7 hour courses: approx. 200, 1 lesson: 40, rental: 20/h, canoe: 10/h, trapezio: 5/h, wet suit: 5/h. Aqua volley-ball. Internet for free. Daily menu. 8 a.m. - 7.30 p.m. Price for 2 sunbeds + 1 parasol: 15 - 19 (seasonal only). Entrance: 5. sand, pebble, restaurant, snack bar, WC/restrooms, locker rooms, sunbeds/umbrellas, image, 8 a.m. - 7.30 p.m. Price for 2 sunbeds + 1 parasol: 15 - 19 (seasonal only). Entrance: 5. It is possible to hire sunbeds by the hour: 1 /h (from 2 hour 0,50 ). sand, pebble, snack bar, WC/restrooms, showers, locker rooms, Friday night is karaoke night! Open: 8.30 a.m. - 7.30 p.m. Prices: 2 sunbeds + parasol - 22 - 25 (seasonal). pebble, snack bar, WC/restrooms, showers, locker rooms, sunbeds/umbrellas, image, Open: 8.30 a.m. - 7.30 p.m. Prices: 2 sunbeds + parasol - 22 - 25 (seasonal). Open from the end of May until September, from 9.00 to 7.00 o'clock. 18 - 23  each day, with changing cubicle. 190  for one week. sand, pebble, handicapped accessible, snack bar, WC/restrooms, showers, locker rooms, parking options, sunbeds/umbrellas, image, Open from the end of May until September, from 9.00 to 7.00 o'clock. 18 - 23  each day, with changing cubicle. 190  for one week. 8 a.m. to 7.30 p.m.
sand, pebble, restaurant, snack bar, WC/restrooms, showers, locker rooms, sunbeds/umbrellas, image, 8 a.m. to 7.30 p.m.
Open: April to September every day from 8 a.m. - 7 p.m. Price for 2 sunbeds and 1 parasol: 14 - 23 (seasonal) Special offer: cartoons and games for children. sand, handicapped accessible, restaurant, beach volleyball, water gymnastics, snack bar, WC/restrooms, showers, locker rooms, parking options, sunbeds/umbrellas, image, Open: April to September every day from 8 a.m. - 7 p.m. Price for 2 sunbeds and 1 parasol: 14 - 23 (seasonal) Special offer: cartoons and games for children. Open: 9.00 am - 7.00 pm. Daily: 28  ; Weekly: 125 . sand, pebble, handicapped accessible, beach volleyball, snack bar, WC/restrooms, showers, locker rooms, parking options, sunbeds/umbrellas, image, Open: 9.00 am - 7.00 pm. Daily: 28  ; Weekly: 125 . Since 1923 has had German-Italian owners. Open from Easter until the end of September each day from 9.00 to 7.00 o'clock. 2 People pay 27 each day or 180 for one week at peak season. sand, handicapped accessible, child care, water gymnastics, snack bar, WC/restrooms, showers, locker rooms, parking options, sunbeds/umbrellas, Since 1923 has had German-Italian owners. Open from Easter until the end of September each day from 9.00 to 7.00 o'clock. 2 People pay 27 each day or 180 for one week at peak season. Subject to row, between 24 - 38  for 2 people, and 15  for one single sunbed. Open: 9.00 a.m. - 7.00 p.m.
pebble, snack bar, WC/restrooms, showers, locker rooms, parking options, sunbeds/umbrellas, image, Subject to row, between 24 - 38  for 2 people, and 15  for one single sunbed. Open: 9.00 a.m. - 7.00 p.m.
9.00 a.m. to 7.00 p.m. 2 sunbeds + umbrella per day: 18 EUR. pebble, restaurant, beach volleyball, snack bar, WC/restrooms, showers, locker rooms, parking options, sunbeds/umbrellas, image, 9.00 a.m. to 7.00 p.m. 2 sunbeds + umbrella per day: 18 EUR. Every wednesday from 7.30 p.m. until midnight: dinner with music. pebble, playground, restaurant, snack bar, WC/restrooms, showers, locker rooms, sunbeds/umbrellas, image, Every wednesday from 7.30 p.m. until midnight: dinner with music. Open: 9 a.m. - 7 p.m. Prices: 2 sunbeds + parasol ca. 25 (seasonal). 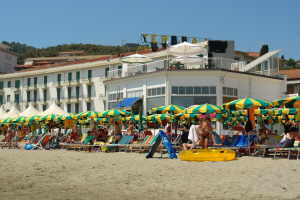 pebble, snack bar, WC/restrooms, showers, locker rooms, sunbeds/umbrellas, Open: 9 a.m. - 7 p.m. Prices: 2 sunbeds + parasol ca. 25 (seasonal). 9.00 a.m. to 7.00 p.m.; 16-18 EUR per day; 96-108 EUR per week. pebble, beach volleyball, snack bar, WC/restrooms, showers, locker rooms, parking options, sunbeds/umbrellas, image, 9.00 a.m. to 7.00 p.m.; 16-18 EUR per day; 96-108 EUR per week. Price approx: for 2 sunbeds and a parasol: for 1 day: approx: 14-22. For 7 days: approx 82 - 127. For 14/15 days: approx. 155-240. 25 - 31 days: approx. 248- 382. (depends on season) Pilates and Babygym. Kicker (chargeable). Internet for free. sand, handicapped accessible, playground, water gymnastics, snack bar, WC/restrooms, showers, locker rooms, sunbeds/umbrellas, image, Price approx: for 2 sunbeds and a parasol: for 1 day: approx: 14-22. For 7 days: approx 82 - 127. For 14/15 days: approx. 155-240. 25 - 31 days: approx. 248- 382. (depends on season) Pilates and Babygym. Kicker (chargeable). Internet for free. Open: 8 a.m. - 8 p.m., prices: 2 sunbeds + parasol 25 - 34  (seasonal). 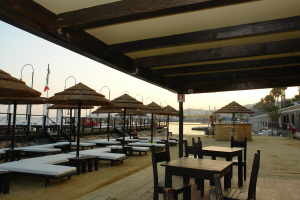 pebble, restaurant, paddle boat rental, snack bar, WC/restrooms, showers, locker rooms, sunbeds/umbrellas, image, Open: 8 a.m. - 8 p.m., prices: 2 sunbeds + parasol 25 - 34  (seasonal). Open every day from 8.00 a.m. - 7.00 p.m. Price for 2 sunbeds and 1 parasol: between 14 and 23 (seasonal). Offer: swimming courses (private lesson: 15; group lesson: 10). sand, handicapped accessible, water gymnastics, snack bar, WC/restrooms, showers, locker rooms, sunbeds/umbrellas, image, Open every day from 8.00 a.m. - 7.00 p.m. Price for 2 sunbeds and 1 parasol: between 14 and 23 (seasonal). Offer: swimming courses (private lesson: 15; group lesson: 10). 9 a.m. - 7 p.m.; sunbed: 6 , parasol: 2,50 . sand, beach volleyball, WC/restrooms, showers, locker rooms, parking options, sunbeds/umbrellas, image, 9 a.m. - 7 p.m.; sunbed: 6 , parasol: 2,50 . Price for umbrella and 2 sunbeds: 18 /day. rock, pebble, snack bar, WC/restrooms, showers, locker rooms, parking options, sunbeds/umbrellas, image, Price for umbrella and 2 sunbeds: 18 /day. June to September 15th each day for 2 people. Advance booking not possible. sand, showers, locker rooms, parking options, sunbeds/umbrellas, June to September 15th each day for 2 people. Advance booking not possible. A very good homepage with all the information about the beach. sand, pebble, playground, restaurant, child care, snack bar, WC/restrooms, showers, locker rooms, parking options, sunbeds/umbrellas, image, 9 a.m. - 7 p.m.